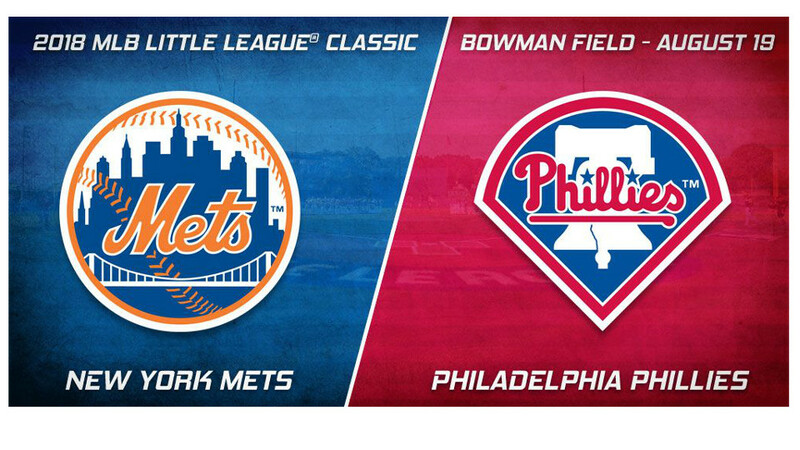 Major League Baseball (MLB), the Major League Baseball Players Association (MLBPA) and Little League International jointly announced that the Philadelphia Phillies and the New York Mets will play in the second "MLB Little League Classic" in 2018. The special regular season contest, as well as ancillary activities by each club, will take place on Sunday, August 19th, with the game airing nationally that evening on ESPN's "Sunday Night Baseball" and ESPN Radio at 7:00 p.m. (ET). MLB and the MLBPA will host the next iteration of the "MLB Little League Classic," which successfully launched in August 2017 with the Pittsburgh Pirates and the St. Louis Cardinals, at the renovated BB&T Ballpark at Historic Bowman Field, the home of the Williamsport Crosscutters . Once again, the participating players, coaches and families of the 2018 Little League Baseball World Series, as well as local Williamsport youth baseball & softball organizations, will fill a significant portion of the capacity at Bowman Field. NOTE: No tickets will be sold for this event which is hosted and produced by Major League Baseball. The "MLB Little League Classic" is held for Little League World Series teams and their families etc. Any tickets made available to the general public via lottery or otherwise is at the discretion of Major League Baseball. If and when that is the case, MLB will make a public announcement with details closer to the event date. The Williamsport Crosscutters have no access to tickets for this event. All inquiries should be directed to Major League Baseball. Major Leaguers on the Phillies and Mets will attend Little League Baseball World Series games earlier in the day on August 19th, which again demonstrates the players' passion and commitment to helping grow the game at the youth level. Crosscutters Principal Owner Peter Freund stated, "We are excited to again work with Major League Baseball and Little League on this special event at our ballpark. We can't wait to welcome back all our former Cutters players who are now part of the Philadelphia Phillies." Historic Bowman Field, in which underwent a $4 million renovation prior to the 2017 MLB Little League Classic, opened in 1926. It is the second oldest Minor League ballpark in the United States. More than 560 Major Leaguers, including Hall of Famers Nolan Ryan, Bill Mazeroski, Jim Rice and Jim Bunning, have worn a professional baseball uniform for Williamsport. Major League Baseball and the Players Association continue to commit resources to growing the games of baseball and softball, on both the grassroots and developmental levels. In particular, MLB and the MLBPA jointly support a variety of programs through the MLB-MLBPA Youth Development Foundation, including the Elite Development Invitational. Through the Major League Baseball Players Trust, the charitable arm of the MLBPA, Players are dedicated to providing baseball and baseball related experiences to underserved youth, special needs youth and the children of veterans and active military personnel. The PLAY BALL initiative, which is supported by Little League International, USA Baseball, USA Softball, Minor League Baseball and the U.S. Conference of Mayors, is MLB's largest effort to encourage young people and communities to participate in baseball- or softball-related activities, including formal leagues, events and casual forms of play. PLAY BALL events have become MLB's signature youth engagement activity during the professional and amateur baseball and softball calendar, including key dates throughout the MLB offseason and into the World Series. MLB and all 30 Clubs have committed $40 million of resources toward the growth and sustainability of the Reviving Baseball in Inner Cities (RBI) program. Additionally, MLB supports developmental initiatives aimed at engaging underserved communities, particularly through the MLB Youth Academies and amateur development camps such as the DREAM Series and the Breakthrough Series.